While any piece is capable of moving in any direction, they are limited as to which directions they can move in at any one time. Look at the detail image on this page. Notice the little "fins" on each piece? These are "direction indicators". 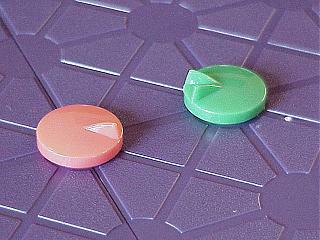 Pieces can only move in a direction indicated by their direction indicators. On their turn, a player can move one piece in any direction allowed by its direction indicator or they can rotate a piece so that its directon indicators point in a different direction. Pieces are captured by moving onto them as in chess. A player is out of the game when they have lost their Commander or all of their Lances, Probes and Shields. There are both two and four player versions of the game. This is a very interesting variant of chess and one that is probably as complex. The restrictions on movement direction adds an entirely new dimenson to the game. 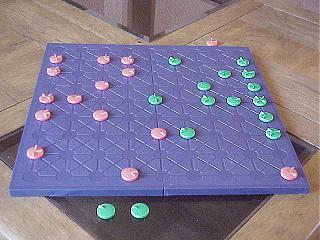 The only negative I have about this one is that the game board is an absolutely hideous color of purple. (It looks more futuristic, I guess) This is another of my favorites in the 3M Bookshelf line. Written by Dennis Matheson. This page is from Dennis' site The Game Pile . WWW page created: February 22, 2000. Any details on the array - where each piece starts and pointing in which initial directions? The Tourney .zrf also has Ploy as one of the variants. Sam - thanks for the Ploy information. I checked the link in your last comment and ended up at, 'Tournoy [Download instructions] ... Tournoy is a Zillions-of-Games file. It is categorized as: Two dimensional, Large board, In a category all its own. By Jean-Louis Cazaux.' Tournoy does appear to be very similar to Ploy. Ploy is available as a Zillions file Right here on the server. 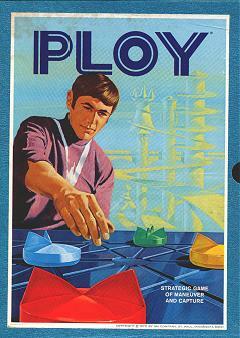 With regard to Feudal, this was published first by 3M, then by Avalon Hill until they were bought out by Hasbro. I get the feeling that the people involved would not object to the game rules being published online, since the game is out of print and probably never going to be published again. I respect copyright; I also don't like the idea of ideas being destroyed because of copyright. I find it somewhat frustrating that countless chess variants from the 20th century (and probably before) are not available online. Encyclopedia of Chess Variants is out of print, and Amazon currently only has one expensive copy available. I think most of the people who invented the variants in the Encyclopedia would have freely published them here if the web and this page existed at the time; the pre-internet model of using books and magazines which you buy to spread information has the advantage that it makes content which you have to pay someone to make available (such as quality novels and stories), but the disadvantage of content no longer being available if the book does not sell.